3 Trolls ...... Website Link: Mr Brown, Mr Red & Mr Yellow! ... The list is never ending for Orcs & Goblins, and I haven't been checking the armybook for what to really get, but I've a load of undercoated/u.n.p.a.i.n.t.e.d models lying in boxes that I'll be working through now I've got time to get on with things. The (reallllly) old GW models (1990!) are all done ... just over 60 of these mob-handed toe-rags! Going to add some shields to a bunch of them to show diff unit stats. I like the old GW Goblin models ... their a bit bigger and have enough scope for finishing details. And they look meaner ... Waaaggghhhh! Just need to get some flags sorted. The newer Gobbo's are still cool with odd quirks to the shamans, leaders & command models, but just a bit small when beside Orcs! And last, but not least, a couple of bowmen to fire off those toothpicks ... War On! I had lots of fun experimenting with these models, using diff skin tones and shading techniques, along with the wacky mushrooms floating about the place ... Gobbo's are def fun to paint, just wish the newer models where bigger. Didn't realise that you could get pre-made banners, so luckily one of the chaps at da-warpath.com pointed me in the right direction .... crackBay! Opps, eBay, but u knew what I meant! Looking forward to seeing your Goblins in the flesh tomorrow. Hi Z ... I'm dreading bring them as I don't have anything decent to put them in! I didn't realise that the models in general are bigger than my LoTr & Tau models I have, which have nice KR Multicase foam trays to protect them, so was just going to use those trays to bring my Os&Gs hordes in ... no chance! Looking forward to seeing the pictures you took. 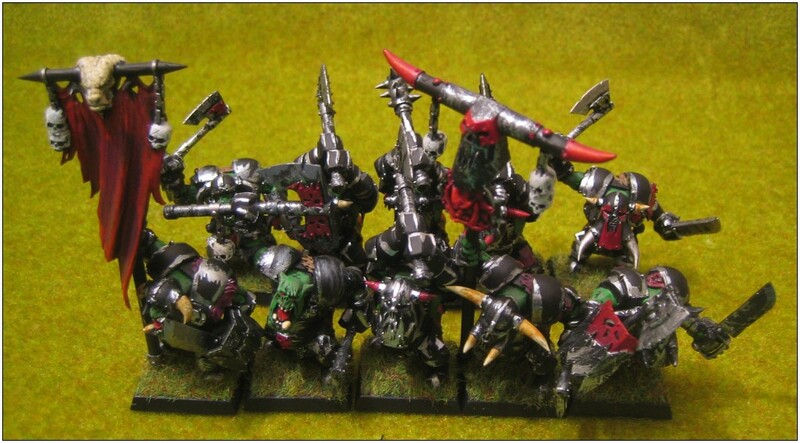 Hey Warmongers ... Got another batch of my Warhammer Fantasy boyz painted ... Black Orcs! Be afraid, be Waaaaaghhhhh afraid!